On the Gold Coast we are blessed with beautiful subtropical weather year round, so why not make the most of it? More and more Australians are adding an outdoor living area to their home, so they can live the alfresco lifestyle in the comfort of their own homes. A patio is a great way to add additional living space to your Gold Coast home. A patio is an outdoor area that adjoins the house. Usually flowing from the house, they become and extension of the inside living space. If its a hot summers day inside and you need more space, a patio extension is going to benefit. Or if its school holidays and the kids are driving you crazy , create more room outside for them to go and play. A patio is a great way to extend your living space. Why not enjoy the great outdoors in comfort? Patios are great for family gettogethers. Why not host the Sunday BBQ by adding a table setting to your patio, or relax on an outdoor sofa and enjoy a balmy summers evening. By adding a patio to your home, not only will you be able to enjoy the outdoor lifestyle, but you are also investing in your home. As more and more people are looking to add outdoor living areas to their homes, when selling your property, a patio can add significant value. The patio area gives a larger perceived living area in the buyer’s mind, as it is more space that will be used for socialising and dining. If you look on real estate websites, the entertainment area is usually the headlining photo because thats where everyone can picture themselves after a long day. 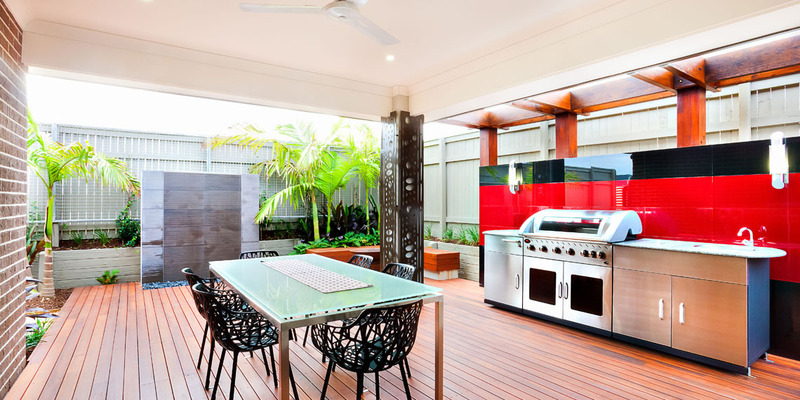 Made from timber, stone, brick, tiles and/or concrete, patios are a lasting addition to your Gold Coast home. With a variety of patio designs available, you’ll be spoilt for choice. No yearly maintenance is required and a patio can be stamped or coloured for a bit of flair and style. So even if you are not thinking of selling your home in the near future, you know that a patio will hold its look and value for years to come. Whether you have a lot of room to play with, or you only have a cosy backyard we can provide a patio that’s perfect for your Gold Coast home. We work closely with our architects and designers to ensure they can provide the design that would suit you best. Call 0410 491 080 for a free onsite project assessment!